An oceanside townhouse in a gated community with 24 hour security. deep-water dockage, ramp, and trailer storage. dinnerware necessary to prepare your favorite meal. huts, etc., but at a price less than local hotels. My Husband and I have been married for over 25 years. We are hard working people that happened to have this great opportunity to own this little piece of paradise in the Florida Keys. We live in Miami and love coming down the Keys on weekends to relax and recharge for the next work week. When our kids were young, we would all go and enjoy boating, swimming and fishing. The kids are all grown and now is just my husband and I enjoying the quiet and relaxing times. After renting for many years in the Keys, We decided to own a unit to enjoy year long. The unit was in poor condition, and most of the repairs were done by Family and friends. We have many memories of great Summer vacations at Our Unit hoping the same traditions are carried down to our kids and hopefully one day our grand kids. If you are like me, when I vacation I take advantage of what the location has to offer on a budget. Our priority is to look for clean & comfortable accommodations. Our unit offers that for you and your family. We try to keep rental fees down in order for everyone enjoy the Florida Keys. We have extras for everyone, games, bicycles, snorkel gear, kayak, we recently added a paddle board because we use so why not let everyone enjoy as well. We have fishing rods, and much more. Our unit is unique in many ways, Its comfortable and inviting like your own home. It gives a sense of calmness and relaxation. Beautifully decorated with a touch of retro. We update as needed and are personally involved with each rental reservation to be certain our guests enjoy their stay. There is always something new to see and experience. We have many extras for you to enjoy. We love our unit at and wish you to love and enjoy it as much as we do. Best regards. Air conditioning, Cable TV, Wi Fi, VCR, DVD player, Stereo, Full Kitchen, Microwave, Dishwasher, Refrigerator, Ice maker, Coffee maker, cookware $ dinnerware, linens & towels, Wahser & Dryer, pool (shared), No pets, No smoking allowed. Fishing rods, movie library, bicycles, football, basketball, tennis rackets and much more for you to enjoy. Kayak available upon request Dock space available for up to 45 foot boat. We really enjoyed our stay in Key Largo. The townhouse was a great size for our family. We enjoyed taking the golf cart to the point to enjoy the sunset. The owner provided masks and snorkels for the lagoon. We left two pairs of flippers for future guests. When the steering went out on the golf cart, the owner even tried to get someone to come and fix it over the holiday weekend. Beachy, Relaxing, Easy and Fab! The ONLY reason this place got a 4 and not a 5 is because the beautiful sand/coral beach had tons of nasty rotting vegetation which stunk and made the sand/coral beach unusable. The locals said it was seasonal... I certainly hope that's the case, because it's a beautiful beach. My kids are a bit older - but, there is a GREAT playground on the premises as well!!! Really great stay, couldn't have enjoyed it more. Due to the hurricane , there was much work that still had to be done in that area. Otherwise, we were very satisfied with the beautiful home. We would recommend others to stay there. Our paradise in Key Largo is fully recovered from the hurricane. The landscape is blooming, and the repairs are complete. Back to enjoying the Keys. This is a very nice unit. Steps away from the pool and the lagoon. Full furnished with bikes, a rentable golf cart and pool accessories. Very spacious and a very comfortable condo. 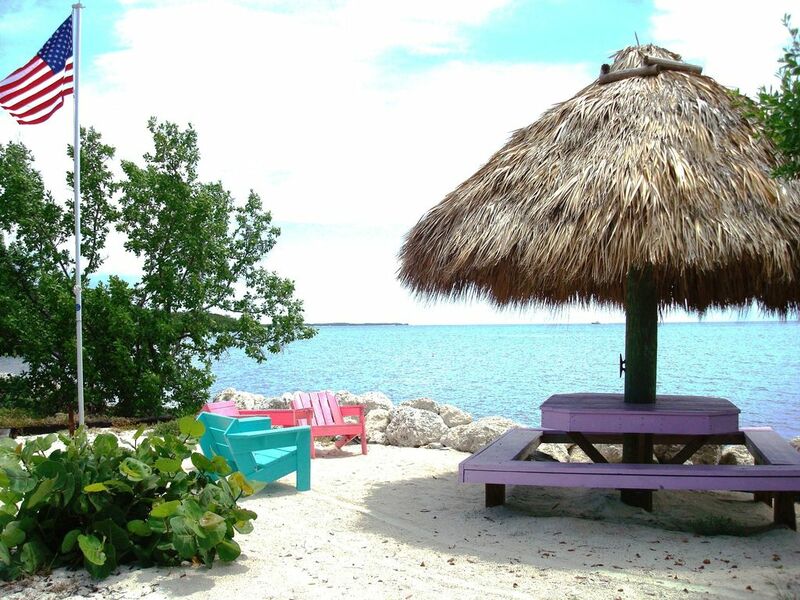 Would definitely reccomend if you want an enjoyable place for you and your family in Key Largo. We had six people staying here and there was plenty of room. All the beds were comfortable, even the bunk beds. This is a good central location to all the things you can do in Key Largo and neighboring islands. Or, just hang around the house, enjoy the grounds, beach, and pool. The place had a very well equipped and stocked kitchen. Washer and dryer were very nice. We thoroughly enjoyed our stay. from Dolphin Plus Center where you can swim with dolphins. Nightly Rate: $250--$300 Weekly Rate: $1500 - $1800 Monthly Rate: $2575- $3000 Rented from January-December Holidays and special weeks more (i.e., Christmas/New Years,, July 4th, etc.) $500 Security Deposit required to confirm; can also serve as damage deposit .